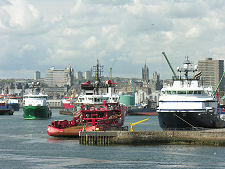 Aberdeen is Scotland's third city, and usually known as the Granite City after its main building material. Aberdeenshire is the fourth largest council area in Scotland. It extends from the high mountains of the Cairngorms in the west across rolling countryside to the sea in the east and north, and it includes some of Scotland's most productive agricultural areas. The east coast tends to be low lying and sandy, while the north coast is rockier and home to many fishing ports, both large and small. For accommodation in Aberdeen & Aberdeenshire see the links in the "See and Stay" menu above. See the map below for an outline of the area and links to surrounding areas. The sea has been vital to Aberdeen throughout its history, and it remains so. In 1970 oil was discovered in the North Sea and Aberdeen became the major service centre for the many oilfields. For the visitor, Aberdeen has a fine city centre focused on the grand, mile long, Union Street. And for those looking for a slightly more peaceful environment Aberdeen also has an attractive two mile long sandy beach stretching between the mouths of the River Don to the north and the River Dee to the south. But before you think of unpacking the swimming costume, remember that Aberdeen is further north than Moscow. Many visitors will find Aberdeen's most attractive nooks and crannies in the area between Union Street and the harbour: though the large and busy harbour itself reflects the city's continuing and very active role supporting the oil industry. Overlooking the harbour is the excellent Aberdeen Maritime Museum. Meanwhile Old Aberdeen continues to offer much of historical interest, as well as being home to St Machar's Cathedral. An unexpected treasure lies in the reception of the headquarters of Aberdeenshire Council, on the edge of the city, where you find the Rhynie Man, a remarkable carved Pictish figure. On the southern side of the city is Torry Battery, which defended the harbour entrance, and the remains of St Fittick's Church. All roads in Aberdeenshire seem to lead to, or from, Aberdeen, so we will look at the area with this in mind. Head south from Aberdeen and you find Stonehaven, which comes complete with its old town and harbour area and an impressive war memorial on a narby hill. This is a town that has kept much of its charm and attracts large numbers of visitors as a result. A little to the south of Stonehaven is another magnet for visitors, Dunnottar Castle, stunningly located on a rocky outcrop nearly surrounded by sea. South again are the old fishing villages of Crawton and Catterline, the latter better known as home to a group of artists in the 1900s. A little south of Catterline is the historic Kinneff Old Church. The importance of fishing is less obvious in Inverbervie, where the original harbour became blocked by a shingle bar. But not far down the coast are the traditional fishing villages of Gourdon, home to the Maggie Law Maritime Museum, and Johnshaven. Inland from Inverbervie at Arbuthnott is the Grassic Gibbon Centre, celebrating the life and work of one of Scotland's foremost 20th Century authors. Further inland is Fettercairn, a beautiful village in its own right and home to one of the country's most attractive distilleries, Fettercairn Distillery. This lies at the southern end of the famous Cairn o' Mount road providing a short cut over the hills to Banchory and Deeside. Heading west from Aberdeen takes you along the River Dee through Peterculter. The A93 through Deeside towards Banchory passes two superb castles, Drum Castle and Crathes Castle. A little to their north is the village of Echt. The surrounding area is especially rich in prehistoric remains, including the Cullerlie, Sunhoney and Midmar Kirk Stone Circles. Close to Banchory is the excellent Raemoir House Hotel. At the far end of Deeside is Braemar, sitting in the heart of the Cairngorms and best known for its Highland Games. The village gained favour with Queen Victoria and still enjoys royal patronage today. Braemar is home to no fewer than four churches, three of which are still active, including Braemar Parish Church. It is also home to two castles. The remains of one, Kindrochit Castle, are slight and lay close to the centre of the village. The other, Braemar Castle, is a popular visitor attraction. The popular ski resort of Glenshee is just a few miles south of Braemar on the busy A93. It is surrounded by the Cairnwell group of three Munros. The heart of Deeside is Ballater, which has strong royal connections. Queen Victoria used Ballater Station when she travelled to Balmoral and though the line is now long closed, the old station buildings still stand and now serve as a museum and tourist information centre. At the centre of Ballater is Glenmuick Parish Church. This serves a large parish rationalised from three existing parishes in 1798: one effect of which was the redundancy of Tullich Kirk. Today Tullich Kirk stands roofless a short distance east of Ballater, and is home to a Pictish symbol stone. Balmoral Castle remains the summer retreat of the Royal Family. 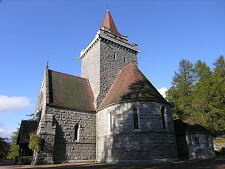 Crathie Church is the local church and where the Royals worship when in residence. 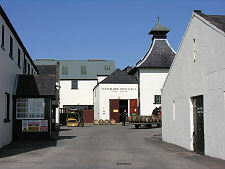 Both are popular local tourist attractions, as is the nearby Royal Lochnagar Distillery, complete with its visitor centre. East along Royal Deeside back towards Aberdeen from Ballater are the villages of Aboyne and Kincardine O'Neil, and then the larger settlement of Banchory. You can almost count Torphins as part of Deeside as it lay on the route of the Deeside railway to Ballater built in the 1850s. 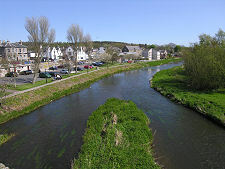 Running parallel to Deeside and to its north is the less well known and wilder valley of Donside, through which the River Don makes its way to the sea. This has been a disputed area over the centuries and that makes it an excellent area for castle collectors. 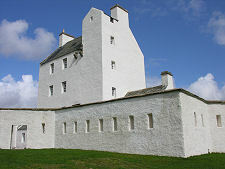 These include Corgarff Castle, wonderfully restored to its role as a government barracks after the 1745 rebellion; Glenbuchat Castle, an interesting "Z" shaped tower house; and Kildrummy Castle, the ruins of what was once one of the mightiest of Scotland's castles, and certainly one of its most besieged. One of the villages forming the scattered community of Strathdon is Bellabeg, famous for its signposts to the settlement of Lost. In the forests north of here is the wonderful Lost Gallery. Lower down Donside is the village of Alford, the home of the Grampian Transport Museum and the Alford Valley Railway Museum. 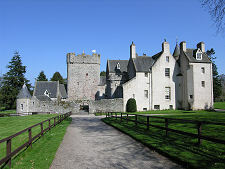 Nearby is the beautiful and unique Craigievar Castle. This whole area is rich in historical interest, ranging in chronological order from stone circles through Pictish symbol stones to churches and churchyards. Stone circles you can visit include the Nine Stanes Stone Circle south of Banchory and the Tomnaverie Stone Circle near Tarland. Slightly more recent is the Culsh Earth House, also near Tarland. Pictish Symbol Stones include the Picardy Stone, plus the Rhynie Symbol Stones and those at Tullich Kirk, at Migvie Kirk and in the gardens of Leith Hall. Roll the wheel of history forward a little further, and you come to the Peel of Lumphanan, the remains of a fortification from the early 1200s. Churches and churchyards worth visiting include Coull Kirkyard, Kildrummy Kirkyard, St Mary's Kirk, Auchindoir, and the magnificently restored interior of Migvie Kirk. As well as the many castles in the area, you can also find a stately home in the form of Leith Hall. 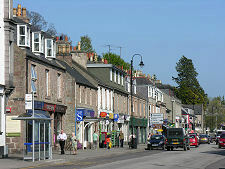 Further north west is the town of Huntly, an attractive place of grey stone laid out in a grid pattern. Here you can visit Huntly Castle, which has a long and turbulent history. Almost hidden away in a glen six miles north east of Huntly is Glendronach Distillery. The route north west from Aberdeen is the A96, which leads past Dyce, Kintore and Inverurie en route to Moray. Dyce is home to Aberdeen Airport and, less well known, to the Dyce Symbol Stones. Kintore is a historic town, with origins that date back to the Romans, who built a large fort here. West of Kintore is the magnificent Castle Fraser, while a little further west is the attractive village of Monymusk, with the nearby Cluny Kirkyard. Inverurie has a great deal to offer the visitor. As well as the town itself, you can find the remains of a motte and bailey castle, the Bass, just to the south, near the historic Kinkell Church. To the north of the town is a Pictish stone in the middle of a housing estate, the Brandsbutt Stone, and the site of the Battle of Harlaw. The East Aquhorthies stone circle lies a few miles west of Inverurie, while the Maiden Stone, one of the most magnificent of all Pictish stones, can be found a few miles north west of it. Close to the Maiden Stone is the wonderfully relaxing Macdonald Pittodrie House Hotel. Following the A947 from Aberdeen brings you to Oldmeldrum, which is five miles north east of Inverurie and home to Glen Garioch Distillery, Scotland's most easterly distillery. Carrying on up the A947 takes you close to Fyvie Castle. Not far west of Oldmeldrum is the Loanhead of Daviot Stone Circle. Travelling east from Oldmeldrum brings you to the village of Pitmedden, home to the superb Pitmedden Garden. North of here you pass the access to Tolquhon Castle en route to the attractive village of Tarves, home to the Tolquhon Tomb. Nearby is Haddo House. Travelling north from Aberdeen along the A90 takes you to Ellon, the ancient gateway to Buchan. Along the coast are a series of villages including Newburgh, Collieston and Cruden Bay, while near the latter is the brooding ruin of Slains Castle: a candidate for the title of Scotland's oddest and perhaps spookiest ruin. Central Buchan offers a series of villages standing on or near the South Ugie Water, including New Deer, Maud and Old Deer. Old Deer is where you find Old Deer Old Kirk, while a little to the west are the remains of Deer Abbey. The summit of a small hill between Old Deer and Maud is home to the Aikey Brae Stone Circle. A little to the north, on the North Ugie Water, is the village of Strichen. Close by is the Strichen Stone Circle. The north-east and north facing coasts of Aberdeenshire form a distinctive area offering visitors a series of attractive towns and villages. 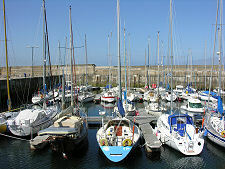 The natural starting point for a description of northern Aberdeenshire is the town of Peterhead with its large fishing fleet and extensive harbour area. Just to its south is the traditional fishing village of Boddam. From Peterhead the coast curves past sandy Rattray Head and the old fishing village of Inverallochy to Fraserburgh, whose fishing fleet competes for size with Peterhead's. Fraserburgh is home to the Museum of Scottish Lighthouses. As you move west from Fraserburgh beyond the old fishing village of Rosehearty a number of attractive bays and settlements dot the coast. 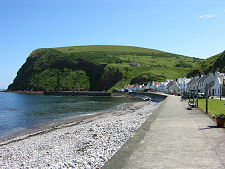 The village of Pennan was made famous as the location for parts of the film "Local Hero". Crovie and Gardenstown are as attractive as Pennan, but benefit from being less famous. 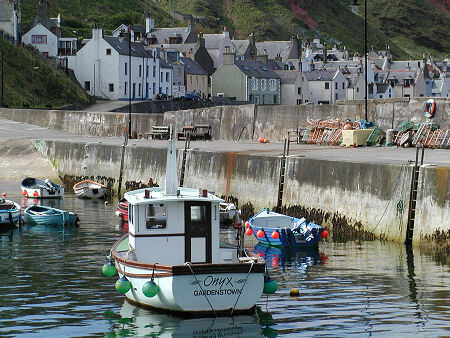 Both are tucked into the cliffside, and while Gardenstown is confined, Crovie is so snugly fitted into its cliffside environment that it is effectively car-free. Heading west again brings you to the major fishing port of Macduff, complete with the Macduff Marine Aquarium. Facing Macduff across Banff Bay, is Banff itself. Inland, the main centres serving a large agricultural area are Aberchirder, to the west of the River Deveron, and Turriff, to its east. Two miles east of Turriff is Delgatie Castle. West of Banff you need to take a detour from the coast road to visit the fishing village of Whitehills, built around its traditional seatown like so many settlements on this coast. A few miles further brings you to Portsoy. Inland from Portsoy is the wonderful little village of Fordyce, still retaining its narrow winding lanes around its village-centre castle. Near the centre of Fordyce is Old Fordyce Church, one of the most fascinating ruined churches you will find anywhere. Onwards again, and you come to the tiny harbour and beautiful beach of Sandend. Overlooking Sandend Bay to the east is Glenglassaugh Distillery, while the cliffs to the west are home to the formidable ruins of Findlater Castle. Driving Tours: You can explore parts of Aberdeenshire by following our Deeside & Donside and Banff & Peterhead driving tours.